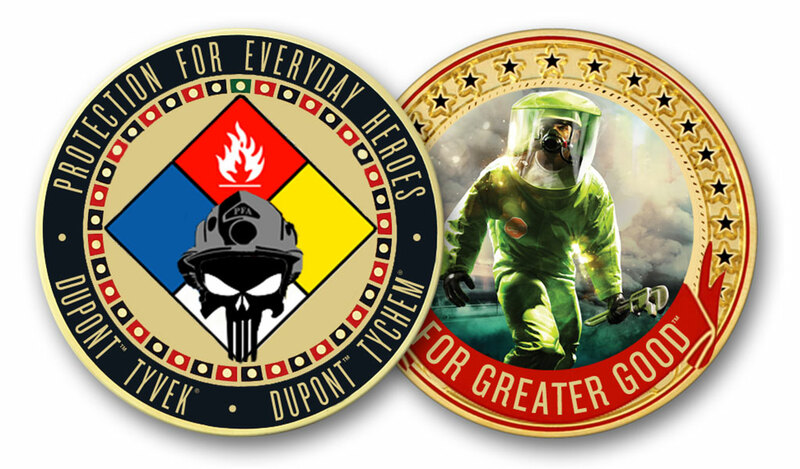 If we publish your article you’ll receive our official Tychem® challenge coin. Who Is the Safety Officer on This Scene? It’s a seemingly innocent question, frequently heard while dealing with a patient, downed firefighter or a hazardous materials technician. But it highlights a bigger issue: the importance of knowing who is doing what during a crucial time. This single question can yield multiple answers at the scene of a downed hazmat technician, and it confirms a problem with NFPA 1407: Standard for Training Fire Service Rapid Intervention Crews. Although this manual provides structured guidelines for firefighters conducting safety operations as a rapid intervention team (RIT), no such standard exists for hazmat technicians. Hazardous materials training for firefighters has two essential levels: operations (initial training, defensive tactics) and technician (advanced training, offensive tactics). Most fire departments have an abundance of firefighters with operations-level hazmat training. Few, however, have an excess of hazmat technicians. The necessary skills for hazmat RIT operations can be easily adopted by operations-level firefighters who can utilize equipment already present at the scene should a technician experience a medical illness, traumatic injury or equipment failure. This frees up hazardous materials technicians for the more specialized work of mitigating the incident. Hazmat technicians face an increased level of risk due to the chemical protective clothing (CPC) they wear. Heat stress, dehydration or exhaustion can occur with any type of protective ensemble. Vapor-tight conditions within a Level A hazmat suit, combined with decreasing oxygen concentrations, can impair judgement and mobility and trigger cardiac events—the leading cause of line-of-duty death (LODD) for firefighters. Maintaining a RIT with multiple firefighters trained in hazmat operations can create a much-needed safety buffer for other responders. Pre-planning with the hazmat RIT can mean the difference between life and death for a downed hazmat responder. Having pre-established points of egress, emergency decontamination and basic rescue equipment such as a Stokes basket, trauma shears and a length of rope can also decrease the reflex time required when a responder is in need. Taking a proactive approach, rather than establishing standards after an LODD, is the main goal of a hazmat RIT program that keeps responder safety in mind. The U.S. Occupational Safety and Health Administration (OSHA) standards allow first-responder operations personnel to enter a hot zone and rescue those who can be quickly accessed. OSHA permits operations-level personnel to respond offensively to hazmat incidents for this specific function. However, responders need training to function in these tasks—training that falls outside the core curriculum provided in operations-level training. If an emergency responder hasn't been trained in a specific function, they can't perform it during an emergency, and the employing agency will be held liable for any injuries or fatalities that occur. A formalized policy and training program for hazardous materials RIT scenarios has been needed for some time. That's why the hazmat RIT training program was created; it fills this information gap, so that responders can do even more to keep the public—and one another—safe. In Illinois, where I work, the hazmat RIT training program has been well-received and is being actively discussed by policy makers. The curriculum, formed as a collaboration between Argonne Fire Department and Argonne National Laboratory, received copyright protection earlier this year. The program is currently being offered to all levels of fire service personnel: everyone from fire academy cadets to veteran firefighters and hazmat technicians. It's promising that this standard of care is being adopted. For more information about the hazardous materials RIT program, please contact Patrick Jessee, Hazardous Materials Program Manager for NIPSTA, at hazmat@nipsta.org or visit www.nipsta.org. Several years ago, a train derailment occurred on a bridge along a mountain pass in a remote portion of our Appalachian Mountain territory. Both upright and inline railcars were involved. A few overturned. Others plunged into the beautiful trout river below. One tank car ruptured and released several hundred gallons of its contents, a U.S. Department of Transportation (DOT) Class 8 Corrosive. Fortunately, the tank didn't reach the river. It situated itself on dry land, leaving the waterway largely unaffected. However, the product did fill up a drainage ditch a few hundred feet away from a small feeder stream. Initial mitigation included damming and diking the stream to prevent runoff into the main waterway. This day, like every day on an incident scene, began with a very thorough safety briefing. Briefings begin with our overall goals for the procedure, specific hazards and unusual issues that could be present, as well as the necessary provisions to assist with these issues. They end with a discussion of personal protective equipment (PPE) requirements. We welcome questions because they help ensure that we're all playing from the same sheet of music. At the end of the briefing, I always reemphasize safety by asking, "Who is the safety officer on this scene?" The answer is always, "All of us." Once the initial response for the railcar incident was complete, planning for the cleanup began. Removal operations required input from county and township officers, state agencies such as the Department of Environmental Protection (DEP), even federal agencies such as the U.S. Fish & Wildlife Service and the U.S. Environmental Protection Agency (EPA). Together, we needed to keep a downstream town's water supply clean while protecting an endangered mussel that had a breeding bed a few miles away. We also realized that the heavy equipment needed to remove the railcar wreckage and contaminant would occupy a large portion of the stream. After considering those factors, we decided to temporarily reroute the section of feeder stream that emptied into the river. During the excavation of a nearby area, a couple of unidentifiable 55-gallon steel drums were unearthed. The equipment operator who discovered the drums notified the operations command and an all-stop was issued to see what they contained. Inspection revealed that they were part of a used oil "storage" area from a mining camp that was located nearby in the early 1900s. Dozens and dozens of drums ended up being excavated from the banks and hillside along the stream. After the last drums were safely removed, the area was reclaimed per guidance from the EPA and DEP. Even some of the most mundane and normal operations can suddenly change, presenting an entirely new, unanticipated hazard. Clear briefings, a culture of safety and empowerment to speak up are all critical on today's incident scenes. The bulldozer operator quickly identified the issue and took swift and appropriate action, preventing another, potentially catastrophic, spill. Chemical protective clothing selection is a critical part of hazmat response, and the results of a poor choice can show up many years after exposure. Adverse long-term health effects are widespread within the emergency response community. A multi-year study by the National Institute for Occupational Safety and Health (NIOSH), which was completed in 2015, found that firefighters in the survey group faced cancer-related deaths 14% higher than the population at large. More than 20 years ago, I developed a tried-and-true personal protective equipment (PPE) selection process. It is not linked to any specific manufacturer, brand or ensemble design. The process can be broken down into a simple decision-making sequence based on product hazards and use requirements. What level of protection is required and what design of protective equipment is most appropriate? What barrier fabric will provide the highest amount of protection? Does the appropriate garment exist in the marketplace? You must address each of these questions in sequence when selecting PPE for entry into a hazardous environment. The U.S. Environmental Protection Agency (EPA) and the U.S. Occupational Safety and Health Administration (OSHA) have defined four levels of protection from chemical hazards: D, C, B and A. Each level defines an ensemble comprising multiple components. Level B: The Level B ensemble consists of chemical splash-resistant clothing providing full-body coverage and a positive-pressure, self-contained breathing apparatus (SCBA) or supplied-air respirator (SABA) with escape cylinder. Level B provides maximum respiratory and mucous membrane protection and limited skin protection. Level B is the minimum level of protection for initial entry onto an uncharacterized site for emergency operations. Type I: Level B Type I garments are designed to cover the wearer completely, and the SCBA used for respiratory protection is worn on the inside of the chemical protective garment (depending on its design). Type I garments are a good choice to start with because they provide wearers with maximum protection. The respiratory-protective equipment is protected from permeation, degradation or corrosion due to the effects of chemical exposure. The ease and speed of donning and doffing the ensemble, as well as the garment's smooth surfaces, allow for easier scrubbing during the decontamination process. Type II: Level B Type II garments have a hooded design and allow for the SCBA to be worn on the outside of the chemical garment. Currently, DuPont produces a garment with a tight-sealing face hole that aids in making the ensemble splash resistive. Use of Level B Type II garments is restricted to work where movement is a limiting factor, such as a confined space. Severe limitations to wearing these suits include the time required to don and doff the garment; the exposed respiratory protection; and the difficulty in decontaminating the garment adequately due to all the nooks, crannies and penetrations that exist in the seams, zipper and hood area. Type III: Level B Type III garments are designed for use with a SABA equipped with an escape cylinder. This type of respiratory protection; is worn either inside or outside the chemical protective garment (depending on its design). Type III ensembles give users the freedom of extended time on air. This is both a blessing and a curse, because that freedom comes with other limitations. Even though breathing air might last an extended amount of time, the wearer might not be able to manage the heat stress incurred. In addition, when working on an airline, NIOSH allows a maximum 300-foot distance from the air source. The airline also limits motion because it acts like a very heavy leash; the more length used, the greater the weight and the more restricted the mobility of the worker. Level A: This level of protection consists of gas-tight/vapor-protective, chemical-resistant clothing providing full body coverage and a positive-pressure SCBA or SABA with escape cylinder. The Level A ensemble provides maximum respiratory, mucous membrane and skin protection. Level A garments are similar in design to Level B garments (with a few exceptions). Type I: Level A Type I garments are designed to cover the wearer and his/her respiratory protection completely. The SCBA used is worn on the inside of the suit. Level A Type I garments have gas-tight seams and zippers and exhaust valves. Type I garments are a good choice to start with, due to their design similarity to Level B Type I ensembles. Type II: Level A Type II garments have a hooded-type design and require the SCBA to be worn outside the chemical protective garment. Currently, only two manufacturers produce garments in this category. Gas-tightness in the hood area can be achieved in some garments. In addition to the suit having both gas-tight seams and zippers, the face hole in the hood is of such a size that the breathing apparatus face-piece will create a seal, making the garment gas tight. Use of Level A Type II garments is restricted to work where movement is a limiting factor, such as a confined space. This is the most appropriate garment to wear in this case due to its slimmer profile. A Type I suit in these circumstances would cause problems due to its inherent bulk. Limitations to wearing these suits include the amount of time required to correctly don and doff the garment; the exposed respiratory protection and the difficulty in decontaminating the garment due to all the nooks and crannies. It should be noted that OSHA, within the 1910.120 regulation, doesn't recognize a Level A Type II garment as a Level A because it is not "encapsulated." This could cause a problem if and when an individual needs to enter a confined space that requires Level A protection. If entry is required, a Class III harness—and all that goes with it—is also required. A Class III harness cannot be worn over an encapsulated suit; it is too bulky and will not fit over the SCBA. Ask yourself the following questions: Do I follow the 1910.120 regulation to the letter? Do I not wear a Class III harness into a confined space? Do I ignore the chemical hazard in the confined space and downgrade my protection to a Level B Type II, even though I'm going into a Level A environment? Type III: Level A Type III garments are designed for use with a SABA equipped with an escape cylinder. This type of respiratory protection is worn inside or outside the chemical protective garment (depending on its design). If the suit being worn is an SCBA/SABA inside version, the airline feeds the respiratory protection through the suit with a device called a "passthrough." This passthrough connects the outside airline to the respiratory device's regulator and provides for a gas-tight seal in the garment wall. The wearer works off the supplied air until there is an emergency situation due to airline damage or diminished air supply. At this time the user could disconnect the airline from the ensemble and breathe from the compressed air bottle that is worn as part of the respiratory device. After you select a level and type, look into your PPE closet. On an emergency incident scene, you must pick from what is available based on the level and type-selection criteria. After you've selected a garment based on certain chemical characteristics, you can check the compatibility of each component. These include the garment fabric, the footwear fabric, the visor material and the glove material. If you select a Level A or B Type II garment (SCBA on the outside of the ensemble), then the SCBA components must be checked for compatibility as well. The cartoons of yesteryear sometimes depicted a young child being force-fed a spoonful of castor oil. The oil was believed to have laxative, anti-inflammatory and moisturizing health benefits; however, it has also been used as a form of punishment through the ages. Naughty children may have gotten a small dose of the thick liquid for misbehaving, but in excess quantities, castor oil has been used as a form of torture. In small doses, castor oil is neither toxic nor generally harmful. However, the seed it originates from does contain a highly toxic component: ricin. Part of what's left over after castor oil is pressed from the seed, ricin is toxic when inhaled, injected, ingested or absorbed through the eyes. A quantity of ricin dust the size of a few sugar granules is all that is needed to kill a person. Symptoms may take hours or even days to develop. Currently, an antidote is not currently widely available, but science appears to be getting closer to one. For now, the best defense against ricin is protecting yourself from exposure to it. Every few years, an incident involving ricin makes the news. The compound's potency makes it popular with terrorists. It is easy to conceal and cannot be immediately detected. Several countries looked at using ricin as a weapon during both World Wars, but it was found to be incompatible with wide-scale attacks and international law. One of the most notorious ricin incidents occurred in 1978. The attack targeted Georgi Markov, a dissident writer and defector from Bulgaria, while he was living in London. The attacker, believed to be connected to the KGB and the Bulgarian secret service, shot a ricin pellet into Markov's leg using an umbrella with a hidden pneumatic device. Initially, Markov did not think much of the incident, noting only that his attacker dropped the umbrella and scurried off with a mumbled apology. It was only later, as he began to feel extremely ill, that Markov believed he had been poisoned. He died four days after the attack. His autopsy confirmed that ricin poisoning was the cause of death. To find out which DuPont products offer suitable protection against hazardous particles, including ricin, visit www.SafeSPEC.DuPont.com. Looking for a way to keep your hazmat training program up to date? The DuPont™ Tychem® Trainer Advantage Program (TTAP) provides support for first responder training facilities across the United States. TTAP offers excellent equipment, technical support and some of the most advanced materials available to enhance the training experience. We believe that how you train isn't just important, it's critical. To find out more about program requirements and the benefits of becoming part of the TTAP community, please contact Gary.M.Burnett@dupont.com . Share your stories, tips and tricks. Copyright © DuPont. All rights reserved. The DuPont Oval Logo, DuPont™ and all products denoted with ® or ™ are registered trademarks or trademarks of E.I. du Pont de Nemours and Company or its affiliates.